Vazhaithandu/ Banana Stem, this is one of the vegetables that I missed back in the US. Though we got raw bananas and banana flower, we never got this, so while visiting India, this used to be a delicacy for us. The vegetable, as such is very rich in fiber and is supposed to be good for kidney stones. 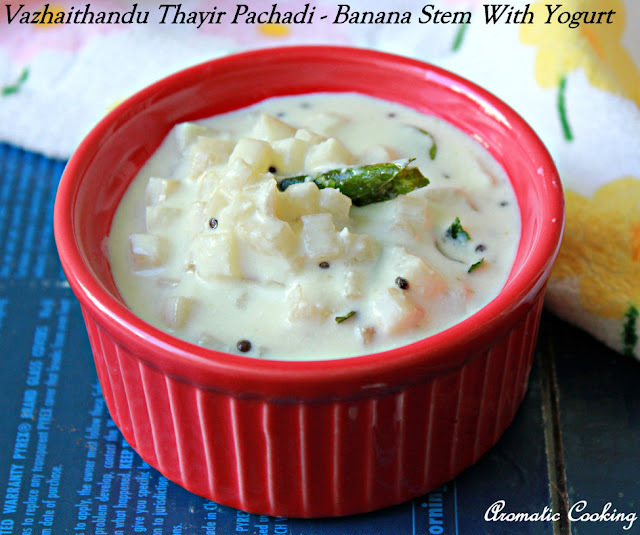 I make a couple of dishes with it, one of them is this Thayir Pachadi, a very easy and healthy preparation. The cooking part is very simple, but preparing the vazhaithandu is what is more important. 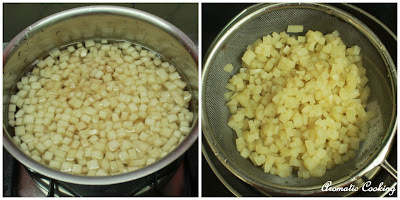 I have given the step by step pictures for preparing this vegetable for cooking. Try this out as part of a healthy meal when you get a chance to find this vegetable.. 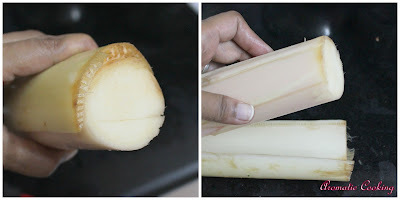 The banana stem looks like a white log, with layers of rind surrounding the smooth interior, we can just make slits and remove the rinds easily, till you get a smooth log. Now slice it, after each slice, wipe and remove with your finger, the fiber that comes after each slice. Keep the slices immersed in water. 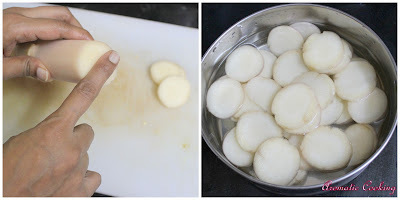 Boil some water and cook the vazhaithandu pieces for just 5 minutes, drain and cool it. Grind all the ingredients given under 'to grind', adding some yogurt, don't add water. 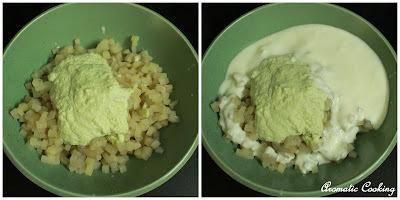 Add the ground paste to the vazhaithandu pieces, beat the yogurt and add, mix everything well along with some salt. 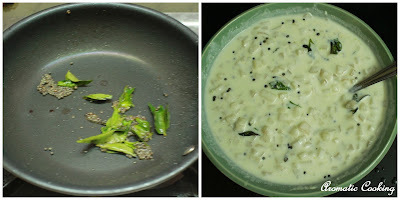 Heat a little oil, add the mustard seeds, once it starts spluttering add the asafoetida followed by the curry leaves, mix for a few seconds and switch off. 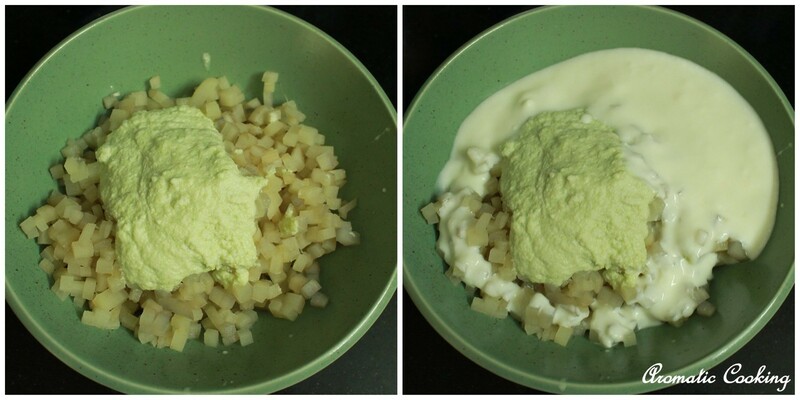 Add it to the yogurt and vegetable mixture, mix and serve. You can prepare the vegetable the previous day, soak it to some thin buttermilk and refrigerate, adding buttermilk prevents the vegetable from changing its color. Do not cook the vegetable for more than 5 minutes, it should have a light crunch to it. Delicious thayir pachadi Hema, I love vazhaithandu, but is it hard to find here. 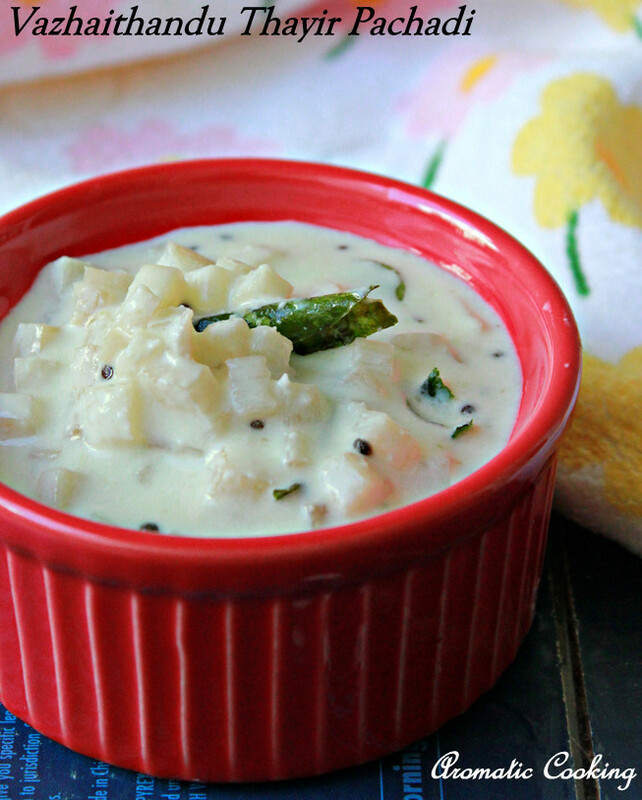 delicious and very healthy pachadi..
We too make moru curry with vaazhaithandu.This pachadi but looks awesome and divine..Lipsmaking. 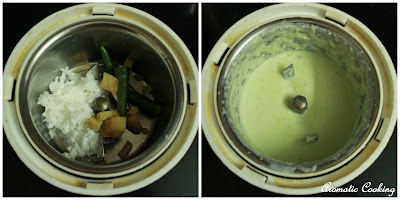 Healthy pachadi and tasty too..
Have not seen this veggie here, I love vazhaithandu. The pachadi looks delicious. never did this before.. healthy pachadi..
Hema, I have never tried this dish. Bookmarked but might have to wait for my trip to India! Just catching up on the posts I missed.